MUMBAI — The Aam Aadmi Party, having shaken up the political order in India by its surprisingly strong showing in the Delhi state assembly elections last month, is also making an attempt to change the way the country’s political campaigns are financed. When the party first began campaigning in 2012, it promised complete transparency in its finances, creating a website in which the name of the donor is listed, along with the donor’s country of residence, the date and the amount of the donation. These efforts mark a considerable departure from the murky practices considered the norm in electoral finance in India. “It’s the first time there has been this level of transparency in fund-raising by a political party in India,” said E. Sridharan, academic director at the University of Pennsylvania Institute for the Advanced Study of India in New Delhi, who has written extensively about electoral finance. The party says that its financial transparency is intended to differentiate Aam Aadmi from the other political parties, which often accept large donations from private enterprises and individual donors. These donors often expect a payback in the form of public sector licenses and favorable regulations. “It was a very conscious decision on the part of the party that we are not going to resort to the usual funding techniques used by political parties, nor are we going to depend on corporates,” said Ankit Lal, social media and IT administrator for the Aam Aadmi Party. While Indian law only requires donations above 20,000 rupees to be made public, the Aam Aadmi Party lists the names of those who give as little as 100 rupees. Also, political parties need to submit their accounts only annually to the Election Commission, but the Aam Aadmi Party has already published their reports of donations on its website. The party has raised 49.5 million rupees, or $794,000, as of Tuesday since its victory in the Delhi state elections in early December. Before the Delhi state elections, the party received an average of 500,000 rupees a day, but currently it is drawing 1.5 million to 2 million rupees a day. For the Delhi elections, over 70,000 individuals donated, of which 55,000 gave 10,000 rupees or less, said Mr. Lal. Nearly 60 percent of the total amount was donated online, where the party has spent much of its fund-raising efforts. Parties can receive an unlimited amount of donations, but for the state elections in December, the party stopped accepting donations on Nov. 17, after it reached its fund-raising goal of 200 million rupees. “We set a campaign cap because we didn’t want to take more money than we needed,” said Mr. Lal. Though the 1-year-old party has found success in fund-raising, the amounts it has received are still small compared what the more established parties have raised in the past. A study by the Association for Democratic Reforms showed that in the 2011-12 financial year, which begins in April, the Congress Party had a total reported income of 3.07 billion rupees and the Bharatiya Janata Party, or B.J.P., had 1.7 billion rupees. However, the Aam Aadmi Party is willing to reject money if the source doesn’t meet its standards for transparency and honesty. It has turned down donations from certain companies that it deemed as having a less-than-clean track record or from donors whose nationality could not be established. Indians living abroad, also known as nonresident Indians, are allowed to donate to political campaigns in India, but foreign nationals are not. According to the Aam Aadmi Party website, the United States has the highest number of nonresident Indian donors as of Tuesday, followed by the United Arab Emirates, Britain, Singapore and Canada. While the average Indian resident donates about 500 rupees, overseas Indians gives an average of 2,000 rupees to the campaign, said Mr. Lal. In an attempt to encourage traceable contributions, political parties receive tax breaks on the condition that they file audited financial statements. However, several loopholes exist in the current political finance laws. While India bans anonymous donations to political parties, unlimited anonymous donations to individual candidates are allowed. Also, because political parties only have to report donations above 20,000 rupees to the Election Commission, many have claimed that they have received multiple donations of less than 20,000 rupees from the same donor. Campaign donations are widely seen as a channel for illegal money, also known as black money, to be brought into the country. In a study published in September by the nonprofit Association for Democratic Reforms, nearly 75 percent of the funding of Indian political parties comes from unknown sources. In August, the Election Commission proposed making it mandatory for all political parties to issue receipts to each donor, irrespective of the amount donated, and maintain an account of all the receipts that will be audited each year. The commission also suggested that parties deposit all donations in designated bank accounts to keep a check on the use of illegal money. The suggestions have been resisted by most political parties. The Congress Party, which leads the governing coalition in New Delhi,sent a letter to the Election Commission saying that it would prefer to maintain the status quo. Officials from the B.J.P. and the Congress Party did not respond to requests for comment. 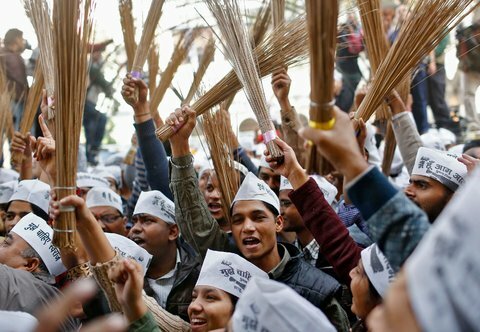 Samya Chatterjee, a junior fellow specializing in political funding at the Centre for Governance and Politics in Delhi, said it was too early to say whether the Aam Aadmi Party’s actions represent a turning point for campaign finance in India. “But it has already set a higher threshold for transparency in political funding than currently practiced by political parties,” he said. However, other experts in electoral and political funding are skeptical that the Aam Aadmi Party’s practices will lead to a greater transparency in Indian campaign finance. One possible solution that has been widely debated is the public funding of campaigns. Currently, the government provides parties accommodation at subsidized rates, income tax exemptions and free air time on state radio and television. “Research shows that one instrument to enhance transparency is direct state funding to parties,” said Sam van der Staak, program manager at the International Institute of Democracy and Electoral Assistance in Stockholm, adding that public funding to parties is now the global norm, with 70 percent of the world’s countries providing it. Additionally, state funding allows the government to insist upon accountability in expenditure and withhold funds in case of noncompliance, he said. “Since political parties will always need money to perform their democratic roles in society, this forces parties to rely on private donations only, many of which come with strings attached,” he said. 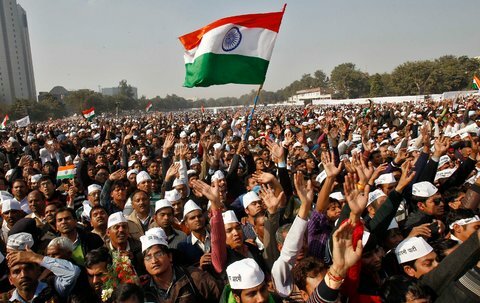 Regardless of what happens in campaign finance, the Aam Aadmi Party has signaled that it will do things its way. “We wanted to send the message that we are not like normal parties,” Mr. Lal said. Published on January 7, 2014 in The New York Times India Ink.